North Carolina’s oyster reefs have countless benefits. A single 3 inch oyster can filter 50 gallons of water a day, cleaning the water in our estuaries and sounds. Reefs provide habitat for other species, like shellfish and juvenile fish, and they produce tasty, healthy oysters for us to eat. As development continues along North Carolina’s coast, our natural oyster reefs are under threat. 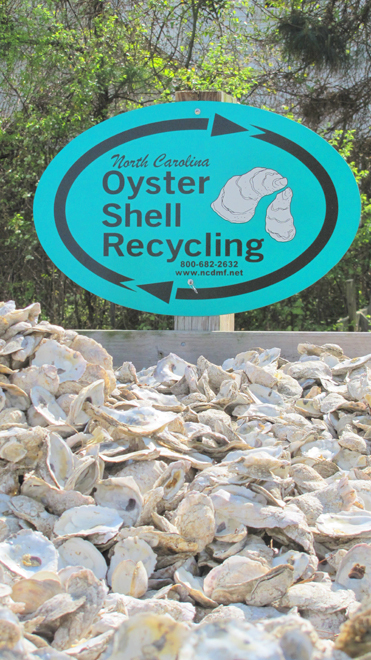 Enter the North Carolina Oyster Shell Recycling Program. Organized by the North Carolina Department of Environmental Quality, this program manages oyster shell recycling stations around the state. The oysters collected will be taken back to the coast to create and restore reefs. Nothing builds an oyster reef better than an oyster shell! Baby oysters can attach to the shells and anchor themselves on the reef, growing for the next few years until they are harvested. Next time you shuck and serve oysters, please consider recycling the shells at the nearest oyster shell recycling station. When North Carolina oyster reefs flourish, we all win.